Apparent video of the incident shows a man rushing the stage shouting "Liberal hate kills"
The decision to inject a Trump look-alike into the leading role in "Julius Caesar" is a provocative one. Jummy Olabanji reports. Police say 28-year-old Jovanni Valle, of Brooklyn, and 28-year-old Salvatore Cipolla, of Oceanside, Long Island, were arrested on trespassing and disorderly conduct charges Sunday evening during the Public Theater production's last performance in Central Park. Information on their lawyers wasn't available. The two were given desk appearance tickets. 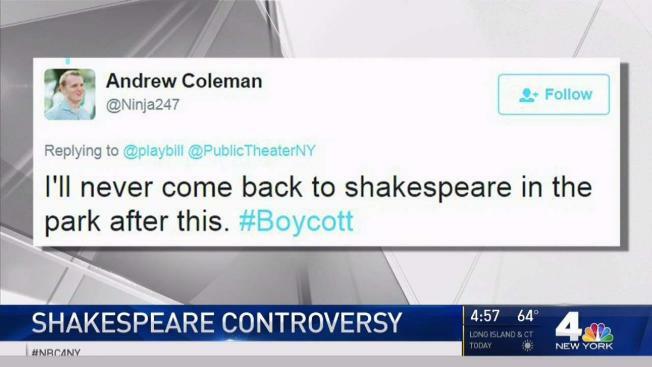 Both Delta and Bank of America pulled their sponsorship of the Public Theater.